Solar is the fastest growing energy source in the world, and for good reason. Solar power offers a limitless supply of clean, safe, renewable energy for heat and power. Solar energy is more affordable, more efficient, and more reliable than ever. Energy prices are forecast to keep rising at 6-7% historical rate per year. Farming and ranching are unpredictable enough without soaring energy rates. Predictable energy costs give you a tremendous competitive edge. 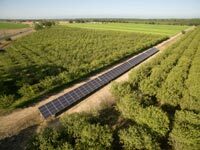 The longer sunny days of summer coincide with peak energy usage for most farmers, ranchers, and processors. With high and variable energy needs, increases in power prices can have a costly impact on your bottom line budget; especially when you rely on power from the utility company. Solar energy provides a consistent power source at lower fixed rates, ensuring that your operation has affordable solar energy when it’s most critical. Urban Design Solar makes solar hassle free. 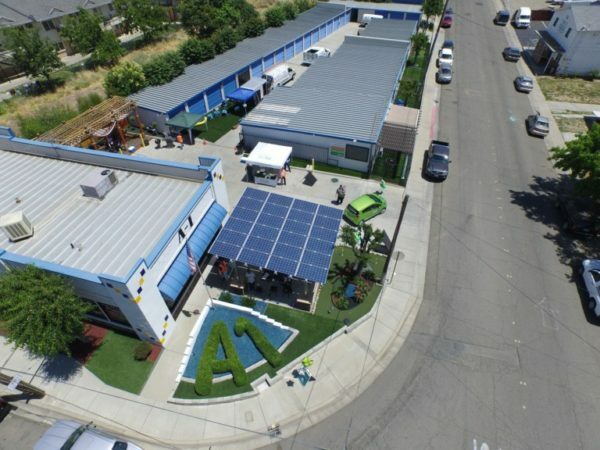 Urban Design Solar understands you can’t afford to lose business due to disruptions. With many years of local experience installing solar energy products, Urban Design Solar has a thorough grasp on completing the necessary paperwork for local permits and working effectively and closely with utility companies. Urban Design Solar is a respected local Contractor guaranteeing your project is completed on time, without budget surprises. Urban Design Solar keeps you updated every step of the way during the solar energy system installation. 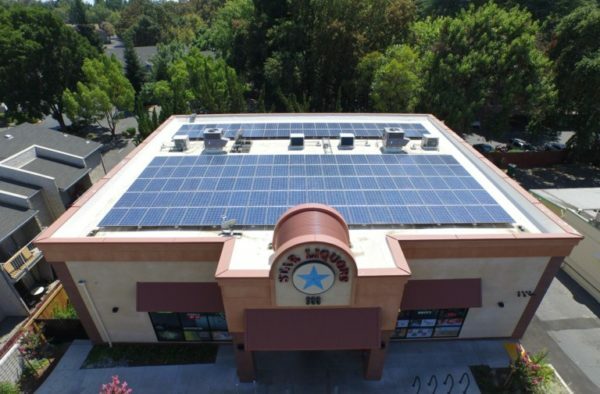 From the smallest retail to larger commercial operations, Urban Design Solar helps you go green and save money. Using solar energy shows your commitment to a cleaner environment and sustainable production. Positive publicity for your solar energy system attracts environmentally conscious customers and end users. 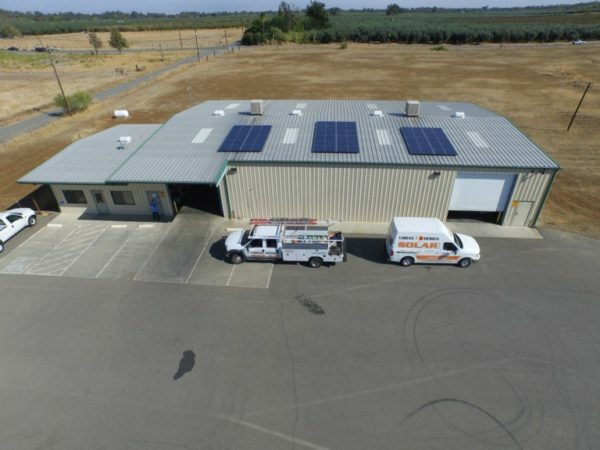 Whatever your type of operation from raw materials production, to retail storefronts, our commercial solar energy solutions provide a marketing opportunity for your operation. Share your commitment to clean energy and greenhouse gas emission reduction by sharing your monitoring portal with customers in a user-friendly format. Pictures and data help people understand the value of solar power and how renewable energy contributes to reducing your carbon footprint. In today’s tough, competitive business climate, energy rates forecast to keep rising at a historical 6-7% rate per year. Anything you can do to lower your fixed costs puts your business ahead of the game. Producing your own power means one less cost to worry about. You’ll notice significant savings to your monthly bill immediately. Utilities such as PG&E offer additional rebates, depending on your location and circumstances. Ask your Urban Design Solar experts what’s available in your area. In California, even some county and city tax incentives, rebates and the total initial cost of lowering your energy bills may be discounted as much as 45%. There are a number of ways to lower your initial solar energy system costs. 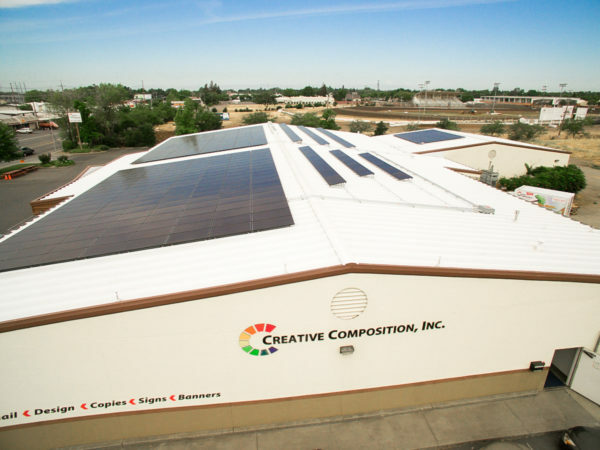 A federal income tax credit equal to 30% of eligible installed cost for solar energy systems with no maximum allowable limit is available for commercial installations. Solar energy systems qualify for an accelerated depreciation schedule under the federal Modified Accelerated Cost-Recovery System (MACRS). Many renewable energy technologies are eligible for a 5 year rapid depreciation deduction on federal tax return. For more information on tax credits refer to IRS Form 4562 and Form 3468 for information on depreciation. Solar energy makes sense. It’s clean energy and it’s a premium sustainable power source. From the smallest culinary greens grower, to large crop processing or ranching operations; taking advantage of this renewable energy source allows your operation to promote the use of green technology methods. This enhances the reasons environmentally conscious buyers choose your products. Is solar energy a good investment? Does investing in solar energy make financial sense for me? Absolutely yes! A solar energy system is an investment that adds both immediate and long-term value to your home or business. Studies have estimated that there are about $1,000 a year in energy savings, which translates to $20,000 increase in the value of a home. If you ever decide to sell your home, research shows that buyers are willing to pay a premium for a home with a solar energy system installed. With a customized renewable energy system in place from Urban Design Solar, the Return on Investment (ROI) ranges from 10-30% depending on system size, building structure and available incentives. You can dramatically reduce your utility energy bills from the very first day your solar energy system is installed and for years to come. Solar users still draw some power from the utility grid, but at a much lower-priced rate. When you switch to solar power, you are hedging against rising utility energy rates. You can lock in low, predictable energy costs for years into the future with solar energy. Why should I buy solar energy system today when prices might drop and new technology might emerge in the near future? Now is really the best time to invest in a solar energy system. You can receive 30% of your solar energy system cost off your federal income taxes credit; these credits can carry forward for five years. Urban Design Solar identifies all of the qualifying programs for your solar energy system and files the required paperwork for you. Utility incentives are being rapidly allocated and federal incentives are set to EXPIRE IN 2019. So now is the time to install a solar energy system and take advantage of current subsidies for the best immediate and long-term savings. Will a home solar energy system increase my property taxes? No. Even though your property increases in value, there is legislation that prevents your property taxes from increasing. In California, the specific legislation is Section 73 of the California Revenue and Taxation Code, which provides property tax exclusion on most types of solar energy systems, including solar power for the home. Can my homeowners association (HOA) stop me from installing a solar energy system? Not in California. In California specifically, the California Solar Rights Act says that homeowners associations, governments, and other organizations can’t stop you from installing a home solar energy system. However, they may ask you to modify the design and/or location for aesthetic reasons as long as the changes don’t significantly impact solar power production (a decrease greater than 10%) or cost more than $2000. How much sun do I need to make a solar energy system worthwhile? In general, the more sun your solar energy system receives, the better return you’ll get on your money. The best roofs get several hours of sun each day, face south or southwest and don’t have too much shade. Urban Design Solar personally checks your roof and shading to make solar power cost-effective and a good investment. Urban Design Solar does this during our FREE site evaluation. Will I need to adapt my home or business to run on solar energy? No. 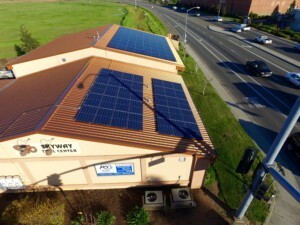 Solar energy systems fit seamlessly onto your building. You won’t have to buy new appliances or change your electrical outlets. Everything works just the same as it did before. When your solar energy system generates more power than your building can immediately use, your excess power flows back to the utility grid, where your meter literally spins backward! You should experience no practical changes except for one: you pay little or nothing to the utility company. What maintenance is required for my solar energy system? Your solar energy system requires very little maintenance. All your solar energy system requires is occasional cleaning and inspection. Urban Design Solar offers monitoring systems to ensure that your solar energy system’s array is operating at an optimal output. Solar energy monitoring systems help guarantee the best return on your investment and alert you if any part of your solar energy system is not working properly. Do I need a battery back-up system? No. Battery systems are expensive and are not yet recommended. Most solar energy systems are connected to the utility grid, so you always have access to a power source. You never have to worry about “running out” of power. However, for properties which are located in a remote area, placing it off the grid, battery back-up systems are available if you wish to have one. What happens when there is little or no sun for my solar energy system? Solar energy users won’t experience any power interruptions as the two power systems (solar and the grid) automatically switch back and forth, allowing you to draw power from the grid whenever you need it. The amount of power your solar energy system generates is a result of direct sunlight, and produces slightly less energy when the weather is cloudy. Your solar system does not produce any energy at night. Every home and business is different. The size of your system depends on your energy needs, roof space and solar power goals. Residential solar energy systems are typically 3-10 kW, and commercial solar energy systems range from 50-500 kW for a medium sized business. Urban Design Solar works to customize the design and meet your specific needs to offset as much of your utility energy bill as you desire. How long does it take to get my new solar energy system up and running? A typical solar energy system installation for a residential roof takes about 3-7 days, and a typical commercial solar energy system installation takes about 1-3 weeks from the day Urban Design Solar begins the installation. However, the length of time of the actual installation depends on the complexity of your roof and the number of solar panels that need to be installed. What happens to the excess power I generate from my solar energy system? Your solar energy system produces the most power during the day. During “peak” hours when the utility energy rates are at their highest, you are replacing the high cost power with your own generated solar energy. This is to your advantage because when your solar energy system generates more power than your house can use, your excess power flows back to the utility grid. The utility company credits you at the exact high rates that you would have been paying. This is referred to as net metering and can generate revenue; most utility companies pay or credit you for this power. How frequently should I clean my solar panels? The location of your solar energy system has an impact on how frequently they need to be cleaned. In dusty locations it is recommended to clean your solar energy system at least twice a year. Urban Design Solar offers solar panel cleaning services for a small extra cost. Most of the parts on your solar energy system, such as solar panels, carry manufacturer’s warranties of 25 years for performance. Other parts, such as inverters, carry 10-year warranties. Most solar energy systems can far outlast their warranties; many of the first solar energy systems installed more than 30 years ago are still going strong. How safe is a solar energy system? Solar energy systems are very safe. Solar energy systems are generally mounted in a low or no-traffic area, have no moving parts and are virtually maintenance free. What kind of permits are needed for installing solar energy systems to meet local building codes? A building permit and inspections are required. 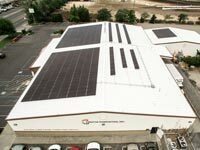 Urban Design Solar creates a solar panel design, handles the permit process from start to finish, and creates a custom plan for your energy requirements. A solar energy system produces the most electrical power during the day. During “peak” hours when the utility rates are at their highest, you are replacing the high energy cost with your own generated solar energy. The credit you generate is then used to offset your power needs at night or when the weather prevents you from generating as much solar power. At night, your solar system does not generate electricity. So when you need power at night, you receive energy from your utility company, and consume your credit. Your electric meter measures and tracks the difference between the amount of power you receive from the utility company and the amount of electricity you generate from your solar energy system. Your monthly statements show the net amount of electricity consumed or produced during the month. Credits and usage vary monthly and you may generate more credits during sunny months and use up the credits during other months. Credits accumulate for up to twelve (12) months. However, most utilities are not required to pay you for excess electricity or any unused credits. Therefore, make sure to get an appropriately sized solar system to cover the energy needs of n your home. Call 530.809.1079 or click the button below to enter your information.